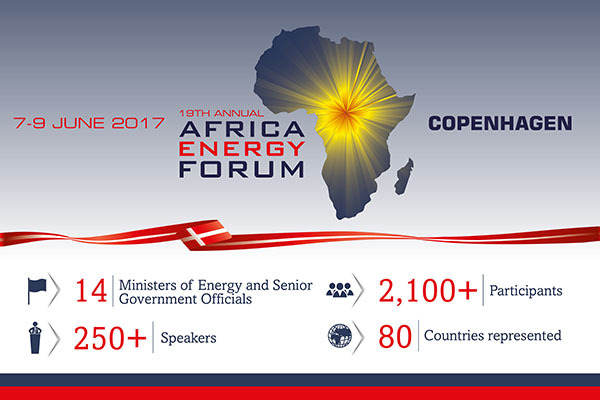 Guests for the 19th Annual Africa Energy Forum (AEF) taking place from June 7-9, 2017 in Copenhagen, Denmark are already arriving for the programme. Nineteen years in the running, AEF has brought together senior-level representatives from all corners of the energy value chain to form partnerships, identify opportunities and collectively move the industry forward. The last edition attracted 2,100 participants from 80 countries, 32 of those being African. In addition 5 major energy deals and mergers were announced, demonstrating the role of the conference as a platform for industry developments. According to organisers of this year’s forum, the 2017 AEF will bring together African ministers, including Sadique Kebonang, Minister of Mineral Resources, Green Technology and Energy Security, Botswana; Professor Alpha Oumar Dissa, Minister of Energy, Mines and Quarries, Burkina Faso; Irene Muloni, Minister of Energy and Mineral Development, Uganda; and Dr Seleshi Bekele, Minister of Water, Irrigation and Electricity, Ethiopia. Others are Obeth Kandjoze, Minister of Mines and Energy, Namibia; Amina Moumouni, Minister of Energy, Niger; Ingele Ifoto, Minister of Energy and Hydraulic Resources, Democratic Republic of Congo; Ambassador Henry Macauley, Minister of Energy, Sierra Leone; and David Mabumba, Minister of Energy and Water Development, Zambia. Also to grace the occasion are Senator Tsitsi Veronica Muzenda, Deputy Minister of Energy and Power Development, Zimbabwe; Basile Atangana Kouna, Minister of Water and Energy, Cameroon; Guy-Bertrand Mapangou, Minister of State in charge of Water and Energy, Gabon; Lantoniaina Rasoloelison, Minister of Water, Energy and Hydrocarbons, Madagascar; representtives of Ministry of Energy, Mines and Sustainable Development, Morocco; and representatives of Ministry of Mineral Resources and Energy, Mozambique. Special Guest of the event is Dr Nkosazana Dlamini-Zuma, former Chairperson of the African Union Commission.